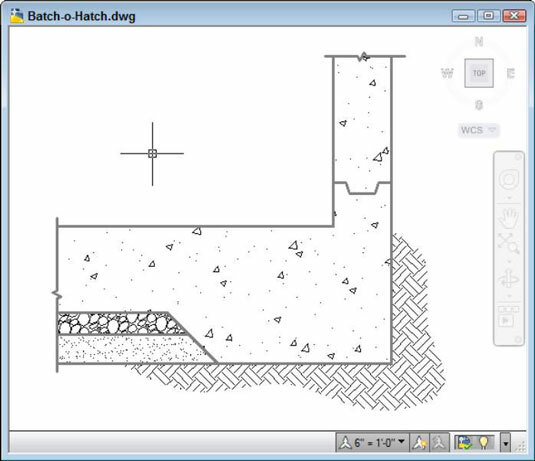 AutoCAD users and drafters often use hatching to represent the type of material that makes up an object, such as insulation, metal, or concrete. In other cases, hatching helps emphasize or clarify the extent of a particular element in the drawing. For example, you can show the location of walls in a building plan or highlight a swampy area on a map so that you know where to avoid building a road. In mechanical design, it’s used to show the cut faces of cross sections. These instructions give you a quick jump-start on the basic process used to create hatching and shows you how easy it is. Start a new drawing, using the acad.dwt template for Imperial units or acadISO.dwt for metric units. Draw a circle with a radius of 5 units (Imperial) or 50 units (metric). Draw a second circle inside the first with a radius of 2 units (Imperial) or 20 units (metric). Start the Hatch command by typing H and pressing Enter or by clicking the Hatch button in the Draw panel of the Home tab on the Ribbon. The Hatch Creation contextual tab on the Ribbon appears. Ignore it for now. Move the cursor on the screen. As the cursor moves within any enclosed area in the drawing, a quick preview appears to show you how the final hatching will look if you pick a point inside that particular area. Starting from outside the larger circle, move it into the space between circles, and then into the inner circle, and then back into the space between circles and note the changes. Pick a point in the region between the circles and then press Enter or the spacebar. Congratulations — in only a few seconds, you’ve done something that would have taken an hour or more in the days of pencil and paper. Click the inner circle, and then click and drag its center grip to move it outside the larger circle. The “hole” in the hatching of the larger circle fills in, and the smaller circle gets filled with hatching. Click the inner circle, and then click and drag its center grip to move it back inside the larger circle. The smaller circle loses its hatching and reverts to cutting a “hole” in the hatching of the larger circle. Place the hatches on a dedicated layer or layers. You can then easily turn hatching on or off. Always use the Continuous line type for hatching layers. Many hatch patterns use noncontinuous lines that are generated by the hatching process. If you place hatching on a layer with a noncontinuous line type then the Hatch command tries to create each of its own noncontinuous line segments from noncontinuous lines and the hatching gets scrambled. Modify each hatch separately. By default, when you select a number of separate, closed areas and then press Enter, the hatched areas are created as a single object. Choose Create Separate Hatches on the Options slideout panel if you want to be able to modify each hatched area. 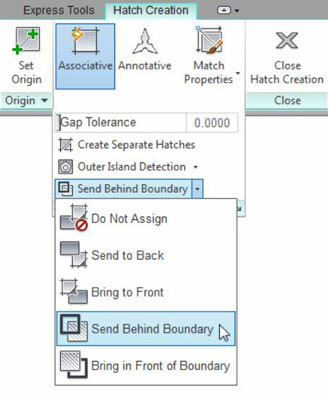 Set the Draw Order drop-down list to specify whether the hatch objects are in front of or behind the hatch boundary or other drawing objects. By default, they’re sent behind their boundary, which is typically what you want. If a hatch is a different color from its boundary and if it’s in front of its boundary, the tips of the hatch objects produce a dotted-line effect along the boundary.